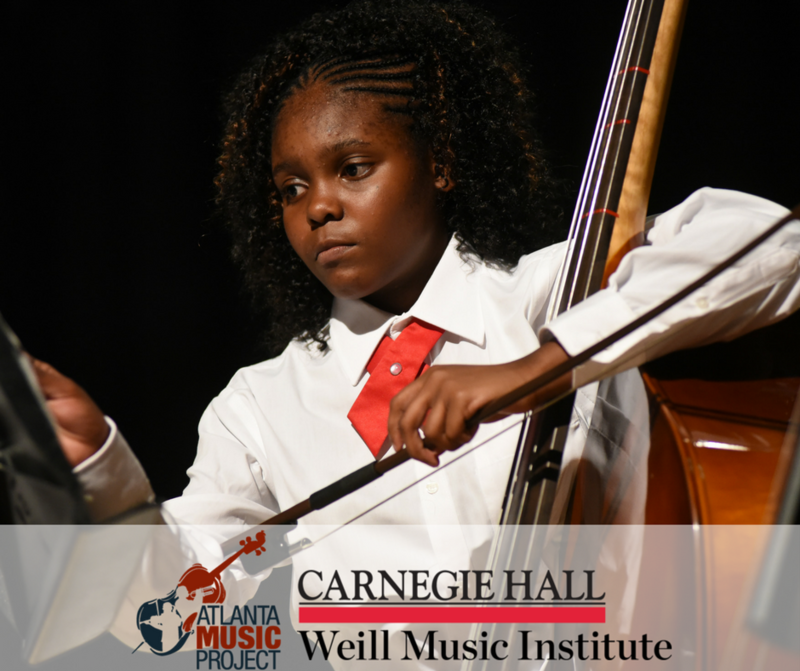 Atlanta, Ga., August 15, 2017 – The Atlanta Music Project (AMP) has been awarded a two-year, $80,000 grant award from Carnegie Hall’s Weill Music Institute. The award is part of PlayUSA, a program that supports a wide range of instrumental music education projects across the United States, all specifically designed to reach low-income and underserved students on a local level. This is the second year in a row that AMP has been awarded funding as part of PlayUSA. The grant award will go towards expanding the AMP Academy – AMP’s advanced musical training for talented and dedicated students – from 35 students to 50 students, providing one-on-one coaching and conducting lessons to AMP’s teaching artists, the launch of a series of masterclasses, and the addition of a bassoon, French horn, oboe and tuba teaching artists. In addition to AMP, Carnegie Hall has selected six new partners and six returning organizations from the 2016-2017 season, for a total of $430,000 in grants. Founded in 2010, the Atlanta Music Project provides intensive, tuition-free music education for underserved youth right in their neighborhood. Now in its eighth year of programming and serving 250 students at five sites, AMP provides all its students with an instrument, a teaching artist, classes in Symphony Orchestra; AMPlify, the choral program of the Atlanta Music Project; the AMP Academy, providing advanced musical training to AMP’s most talented and dedicated students; and the AMP Summer Series, a music festival and school. AMP’s young artists have performed at Atlanta’s most elite venues, including the Woodruff Arts Center, Spivey Hall, and the Rialto Center for the Arts. In 2015 Clayton State University established the Atlanta Music Project Endowed Scholarships, providing college scholarship funds for AMP students. AMP is the recipient of the prestigious 2016 Bank of America Neighborhood Builders award. In 2016 and 2017 the White House named AMP one of the top 50 after-school arts programs in the nation. PlayUSA is part of a growing set of Carnegie Hall initiatives that have expanded beyond New York City to reach students and teachers nationwide. The Link Up program now serves more than 400,000 students and teachers around the globe through more than 100 partner orchestras, and Musical Explorers for grades K-2 reaches thousands more in New York City and at multiple partner sites. The Summer Music Educators Workshop also brings together over 125 teachers from across the country at Carnegie Hall each year for intensive sessions focused on ensemble instruction and classroom strategies. PlayUSA also complements NYO2, an expansion of Carnegie Hall’s National Youth Orchestra of the USA (NYO-USA) that gives young American instrumentalists form communities underserved by and underrepresented in the classical orchestral field the opportunity to study with leading professional musicians and meet talented peers from across the country. Carnegie Hall’s Weill Music Institute (WMI) creates visionary programs that embody Carnegie Hall’s commitment to music education, playing a central role in fulfilling the Hall’s mission of making great music accessible to as many people as possible. With unparalleled access to the world’s greatest artists, WMI’s programs are designed to inspire audiences of all ages, nurture tomorrow’s musical talent, and harness the power of music to make a meaningful difference in people’s lives. An integral part of Carnegie Hall’s concert season, these programs facilitate creative expression, develop musical skills and capacities at all levels, and encourage participants to make lifelong personal connections to music. The Weill Music Institute generates new knowledge through original research and is committed to giving back to its community and the field, sharing an extensive range of online music education resources and program materials for free with teachers, orchestras, arts organizations, and music lovers worldwide. More than half a million people each year engage in WMI’s programs through national and international partnerships, in New York City schools and community settings, and at Carnegie Hall. Congratulations, AMP! So glad to know about your incredible work, and see the support WMI has given your organization.